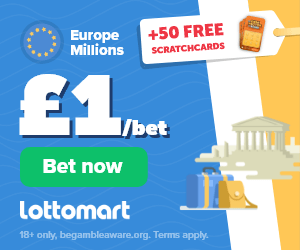 Lotteries.com Review | £5 Free Today Using Promo Code! 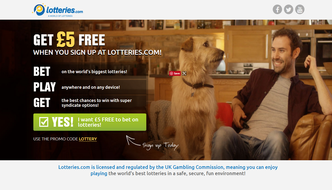 The Lotteries.com website makes it easy for you to bet on some of the World’s biggest lotteries. They have a wide selection of the richest lotteries as well as single or syndicate bets meaning you have more options and the best chances of winning when betting here. The site is run by Multi-Media Entertainments Limited who are professionals with over 25 years experience. The company also owns other Lottery websites. The site is licensed and regulated by the UK Gambling Supervision Commission meaning you can play in a safe, secure and fun environment. If you win at lotteries.com your winnings are paid out in full to your player account without any commissions or hidden fees deducted. Plus part of your bet goes towards various good causes and charities sponsored by lottery companies all around the world. 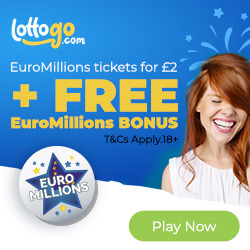 Sign up with lotteries.com today and use the promo code ‘Lottery’ to get £5 added straight into your account. The £5 can be used to for single play tickets or syndicate bets. Any winnings from these bets will be paid in full without any deductions to your player account. Lotteries.com lets you play in lots of different worldwide lotteries. You can play with a group of people known as a syndicate who pool their resources buying more tickets and sharing winnings between each member. Buying as a syndicate significantly boosts your chances of winning a prize. Your odds of winning a prize are enhanced due to the fact that you are buying more tickets for each draw. Recent statistics have shown that 1 in 3 syndicates win a jackpot. As well as syndicates you can also play single lines here. You have the option to play in a regular or super syndicate on each available lottery. In a regular syndicate (the cheaper option) you will play 50 – 100 lines on average whereas in a super syndicate you will play hundreds or even thousands of lines giving you the best chance of winning. The number of people you will split your winning with is shown as shares on each syndicate page. You can purchase more than one share for each syndicate which will mean you get a higher share of the pot should your syndicate win. Select the lottery you want to play on. Place an individual bet (single play) or a syndicate bet to increase your chances of winning. Select your number or use the quick pick for random numbers. Next select how many draws your want to take part in and make the purchase. After this, you will get a confirmation email which will contain your numbers. You can also view your purchase in your player account at any time. Once the result comes in you will be sent an email notification of how much you have won. Your winnings will be paid to your player account as if you had bought the actual ticket. You can make a deposit using Visa, Visa Electron, Mastercard or Maestro. Alternatively, you can use Neteller or Skrill. All winnings will be paid directly to your player account. To make a claim login, select account and then winnings from here you can withdraw how much you want. All winnings are paid back to the card/account you originally used to make a deposit.